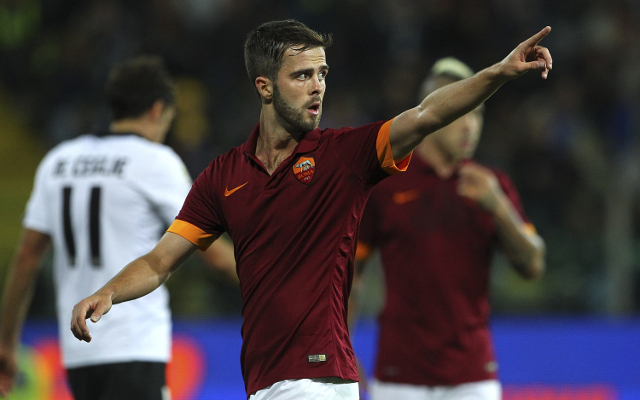 Liverpool and Manchester United’s pursuit of Roma midfielder Miralem Pjanic has taken a twist, following claims that La Liga giants Barcelona are ready to pay £40m to secure his services. According to the Daily Star, the Bosnian could be on his way to the Nou Camp despite it appearing for so long that there would be a two-way tussle between the Premier League rivals. However, with Barca’s transfer ban forbidding them from signing anyone until January 2016, they are unlikely to be in the mood to give up on Merseyside and the red half of Manchester. Playmaker Pjanic still has three years remaining on his contract in the Italian capital but could feel ready for a new challenge, having seen his side once again slip too far behind in the race for the Serie A title. Liverpool are anxious to replace outgoing captain and midfield talisman Steven Gerrard, who joins LA Galaxy this summer, while United are likely to add more flair to a team which has started to win but is still more functional than flamboyant, in stark contrast to the club’s attacking traditions.